What bike do I ride? A question I get a lot is “what kind of bike do you ride?”. On the Fatbike tours I normally ride one of the Motobecane FB4s exactly like the client bikes. 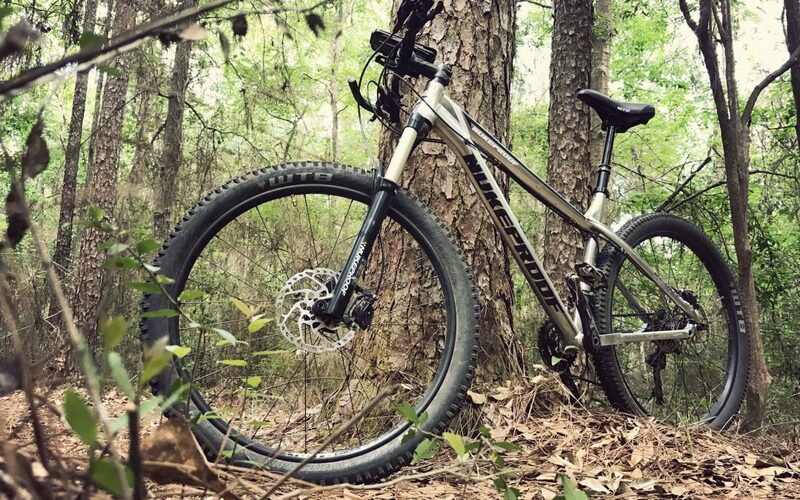 But while a fatbike, with 4″+ tires, is great for sandy trails, they’re not as fast or nimble as a traditional tire bike on regular dirt trails. So when I do serious mountain biking, the bike I ride is a little-known brand that I have personally never seen anyone else riding. It is a Nukeproof Scout 275 hard tail. In fact I had been riding a 1999 Nukeproof Stealth, for the last 15 years until finally breaking down and getting a new bike so that I could enjoy many of the new features on modern bikes. Some of those features are a large tire diameter (27.5″ vs 26″), a dropper post (hydraulically raises and lowers my seat with a lever while riding), better gearing (2×10), more efficient braking (180mm rotors with finned brake pads for cooling) and more travel on my front suspension. I am still somewhat old school and do not prefer to have dual suspension for several reasons that I will not go into as I don’t want to start a debate about it. It is just a personal preference. I also still prefer bar ends, but I did finally progress to having clipless pedals. Nukeproof bikes are imported for purchase in the U.S. Ride Smooth Brother Bike Store is the dealer who I went through and may be the only one on the east coast. They have incredible customer service and I highly recommend them. So there is the answer to what I ride, with probably more info than you bargained for.